The portable, industrial heaters GT 1400 SA-M was introduced in 2016. The GT 1400SA-M is a Stand Alone Mobile version of our popular heater. The GT 1400SA-M comes mounted on our new caster cart with a self-contained 20 gallon fuel tank. The S-AM is fitted with our innovative low profile Intake Hood and has a quick connect hose feature for fast and easy duct attachment. Weighing just 400 pounds (without fuel), the GT 1400SA-M provides a heating and drying solution for all spaces, big and small, spacious and tight. 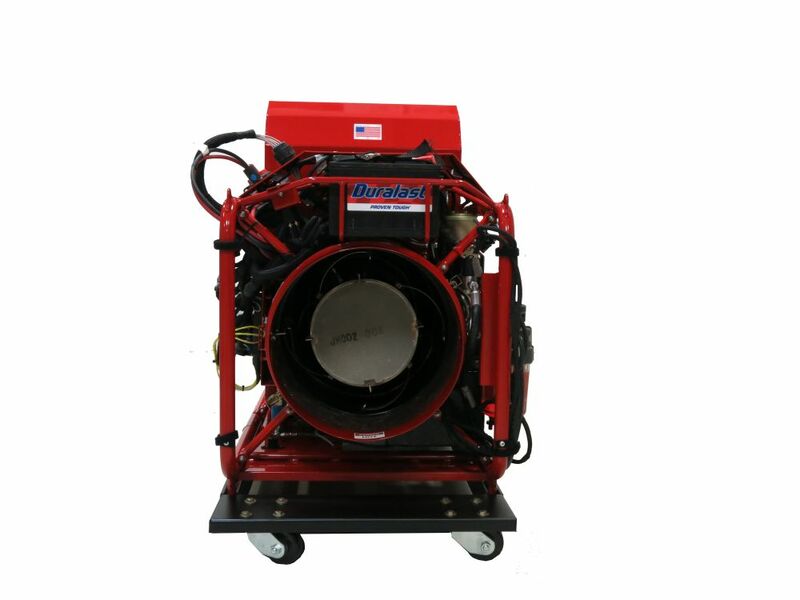 A compact package with no loss of the legendary performance of the standard GT 1400, it is perfect for Thermal Extermination, drying, concrete curing, ground thawing or just the need for old fashioned heat. The portable, industrial heaters GT 1400 SA-M is another exciting example of Jet Heat Engineered innovation for your mobile heating needs! Call us today, toll free, at 1-877-JetHeat or fill out our contact form to learn more. 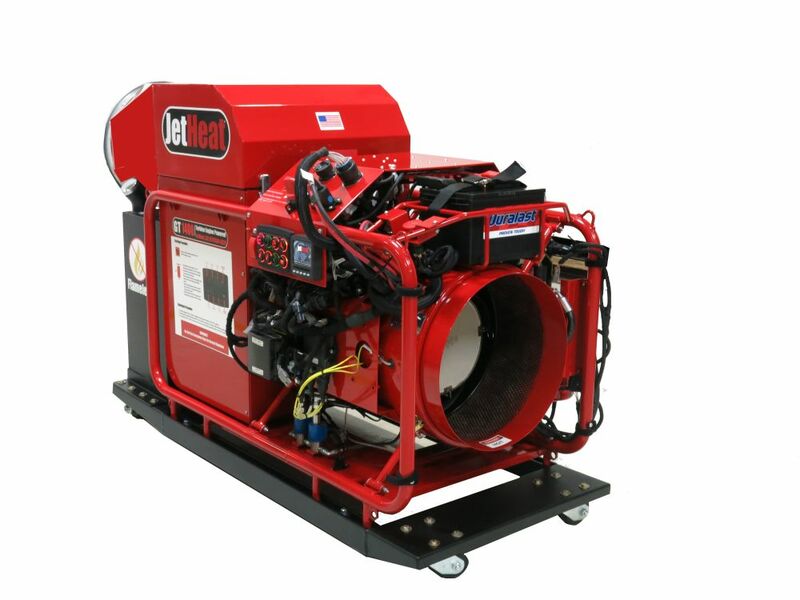 The GT 1400 heater uses an internal combustion Micro Turbine with NO external or exposed flame. 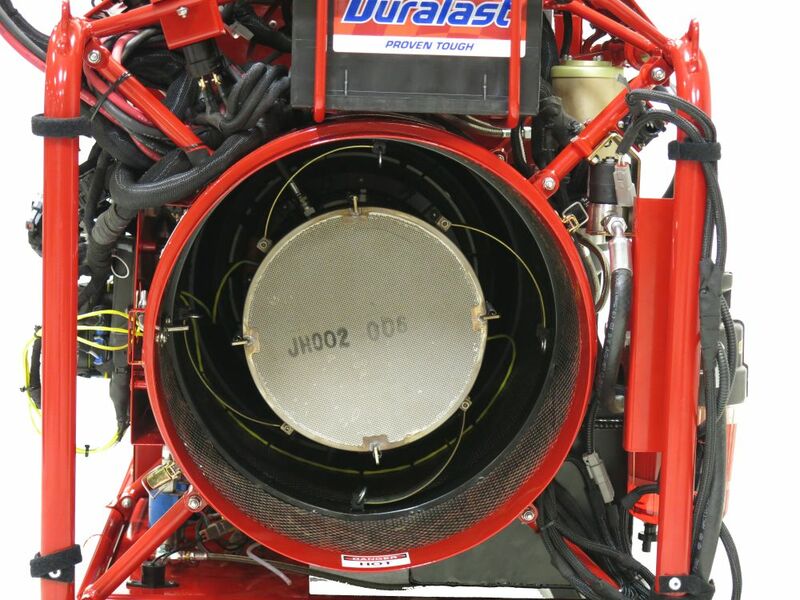 The burning of the fuel is designed to be contained entirely within the combustion walls. 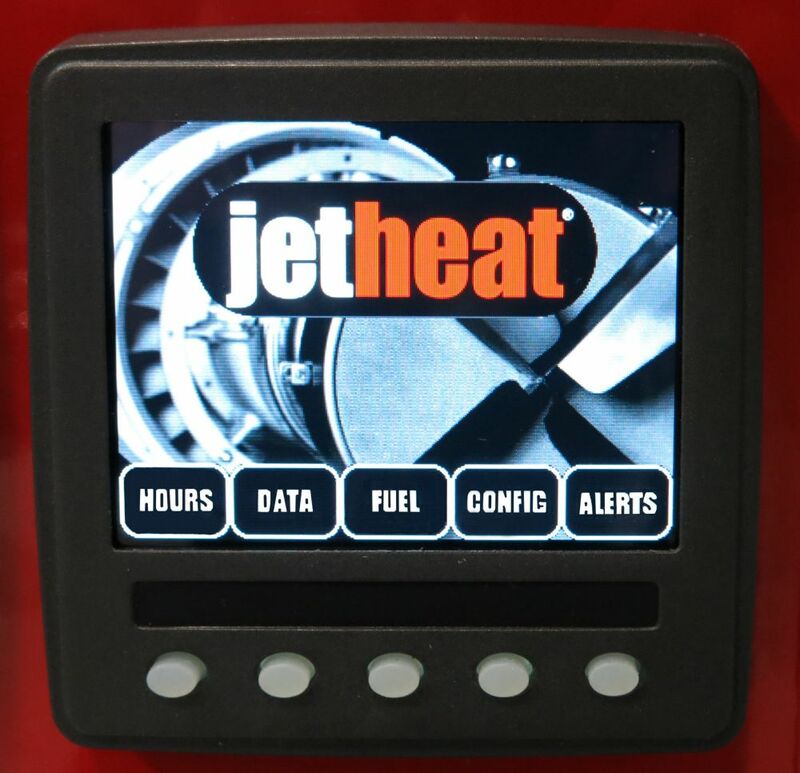 The JetHeat heater module converts over 95% of the ULSD to usable heat. During operation the diesel fuel is vaporized. 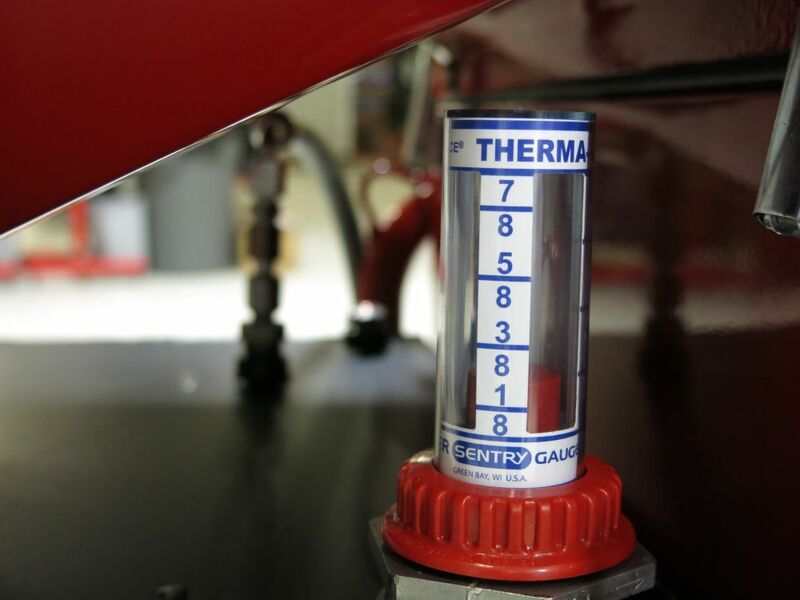 This means it is converted to a gas, rather than burned as a liquid, before it enters the combustion chamber. 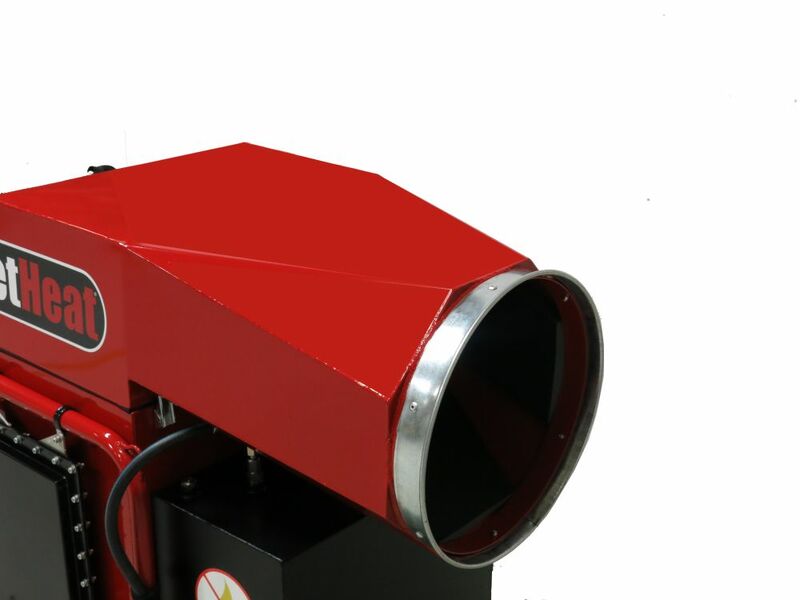 The result is continuously sustained combustion that is highly efficient and extremely clean. You won’t see black smoke come out of a JetHeat GT 1400 like you see on a conventional diesel unit. The output from the JetHeat heater produces clean, breathable air. 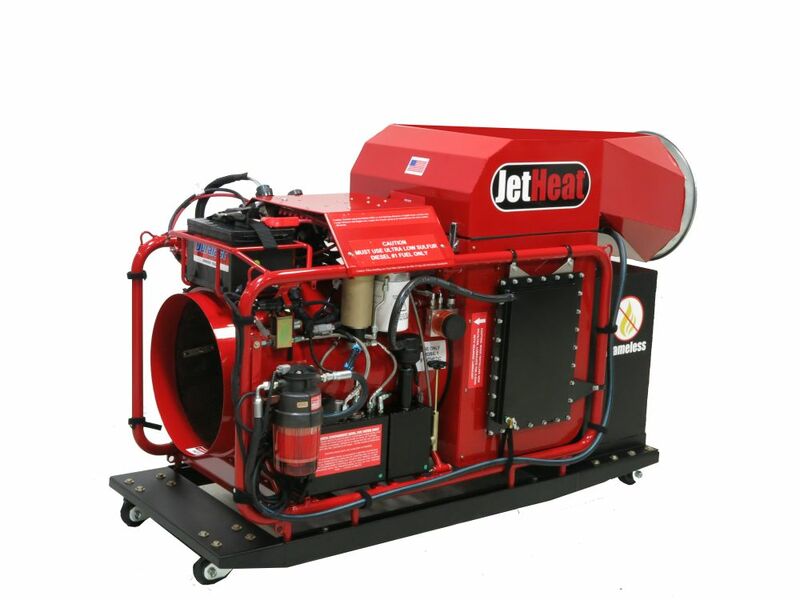 The JetHeat heater is air cooled and has no liquid cooling system. Our diesel competitors have conventional liquid cooling systems. These systems allow a fair amount of the radiant heat generated to escape into the environment. TIME: The fully heated output is extremely rapid. It is usually only 30-60 seconds from a cold start! EFFICIENCY: Unlike our competitors, our outputs are 95% of our inputs. GREEN: Extremely low carbon emissions. Minimal NOX or SO2 is created. SERVICABILITY: Designed to be easy to operate, troubleshoot, and service. 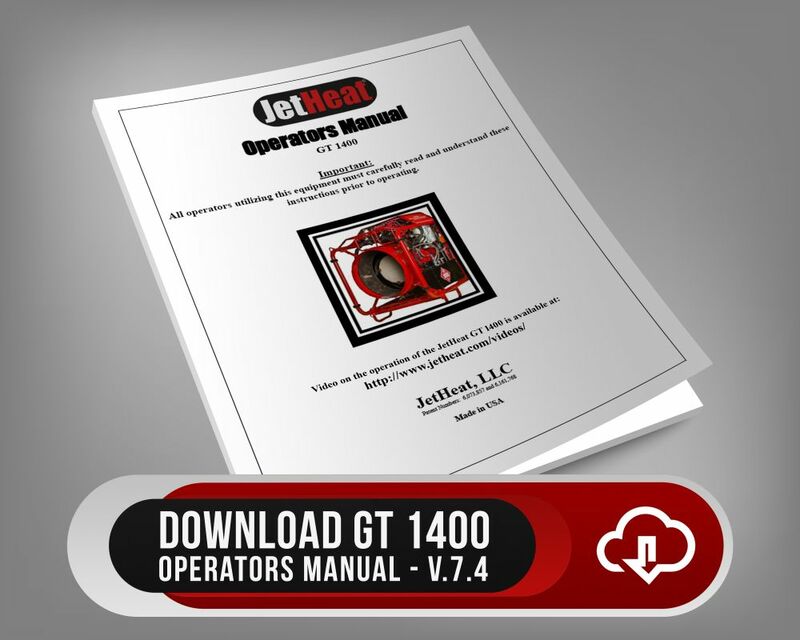 The JetHeat GT 1400 utilizes a cutting edge High Bypass Turbofan and Stator System. The fan and stators are specifically designed by JetHeat, ultilizing advanced aerodynamics to achieve high efficiency. JetHeat leads the industry in flow rates and static pressure capabilities, resulting in product performance that our competitors cannot match. 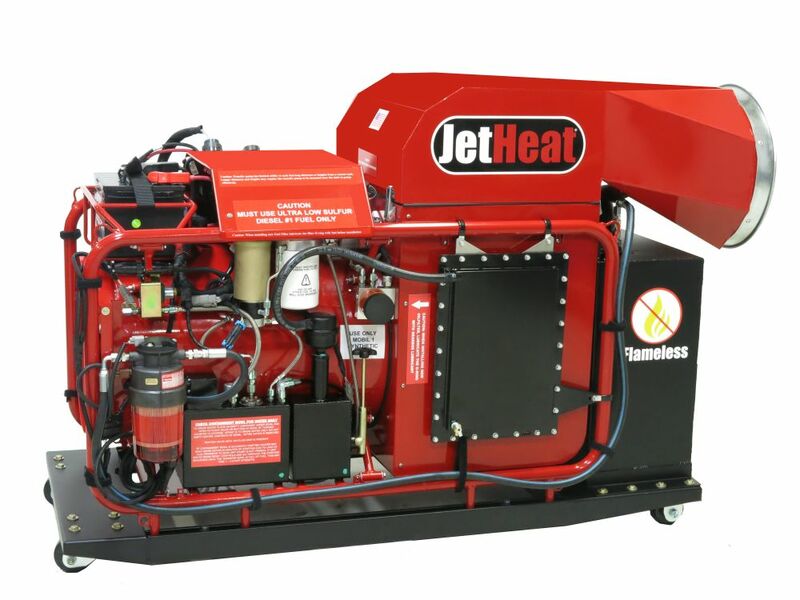 Bottom line: Our heaters produce twice the heat using half of the fuel of competitive products. Better by Design. How do we stack up against the Competition? Take a look at some of the standard features of the GT 1400 in this chart. 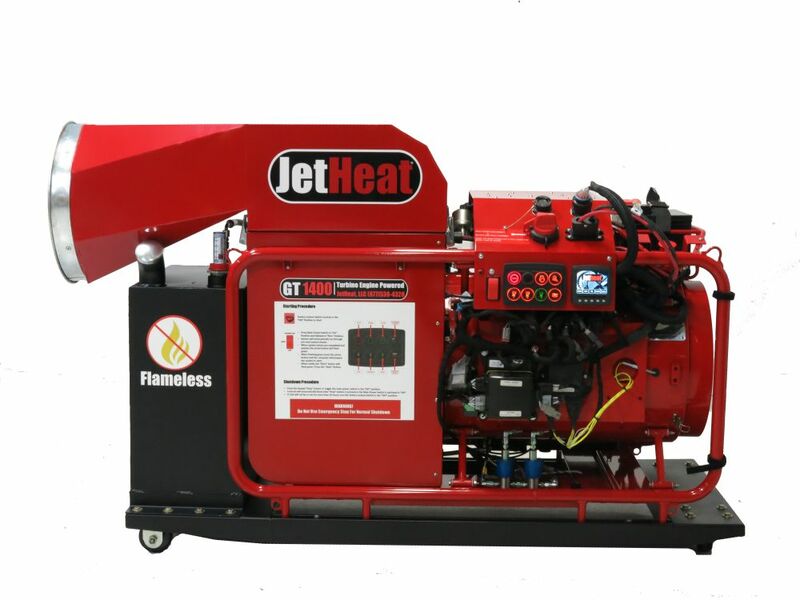 The JetHeat GT-1400 leads the industry in temperature rise. 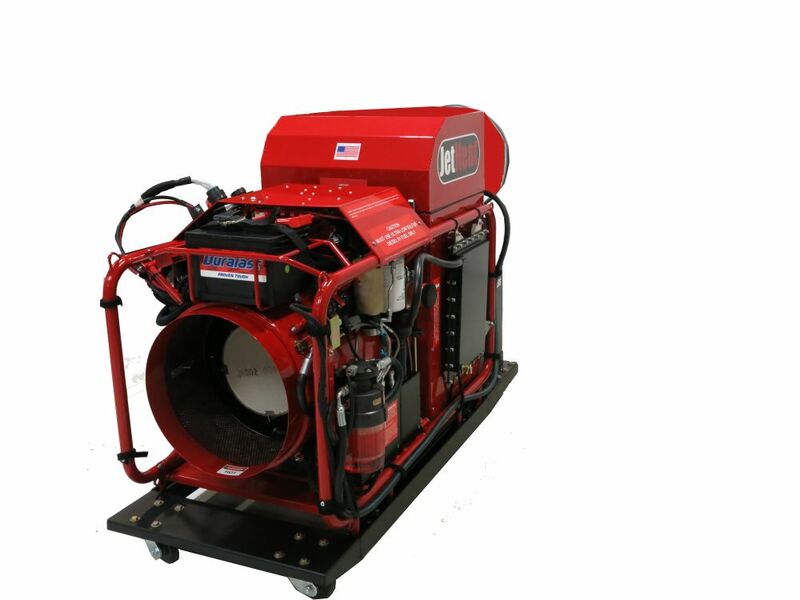 It provides 200 degrees of rise from zero degrees Fahrenheit, while consistently maintaining 5500 CFM+ of hot delivered air. The heat or air output is not diminished even at temperatures below -40F. The GT 1400 heater module is compact measuring a mere 2’ x 2’ x 4’ in size. Our static pressure is also the best in the business. Because the engine is turbine based, employing a stator and high by-pass turbo fan, the output air is highly compressed. 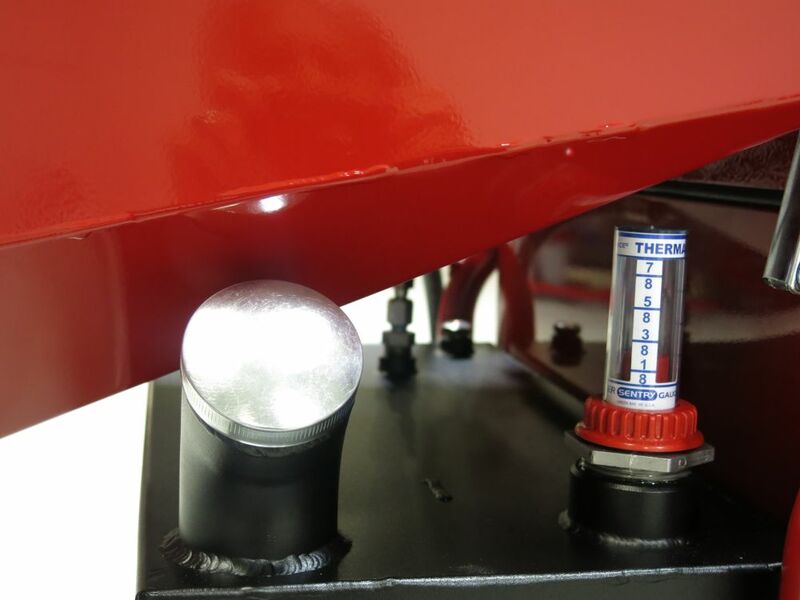 This unique design ensures a high velocity, high pressure heated airstream that is unmatched in its inflating and thawing capabilities. No reciprocating engine based heater system comes close to the GT-1400 in this regard. How Does JetHeat Compare with the Competition? Twice the Heat at Half the Cost. See for yourself! The only approved fuel for the GT-1400 is Ultra Low Sulfur Diesel #1, Diesel #2 or Kerosene fuel. Using other grades of fuel may cause engine run issues or contaminate the catalyst, possibly damaging the engine or compromising air output quality. 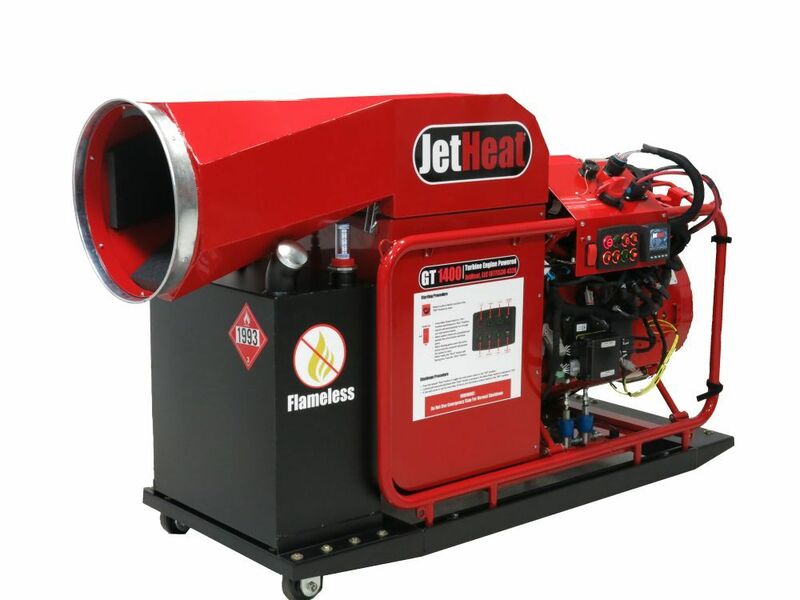 The JetHeat patented catalyst system is so green, it is capable of providing clean, breathable air that meets OSHA, NIOSH, and ACGIH standards; yielding half the carbon footprint of competing products. Green by design, JetHeat is Carbon Neutral vs. the Competition. The GT-1400 produces no Nox and SO2 greenhouse gasses. The low fuel consumption contributes to substantially less CO and CO2 generation than competitors.